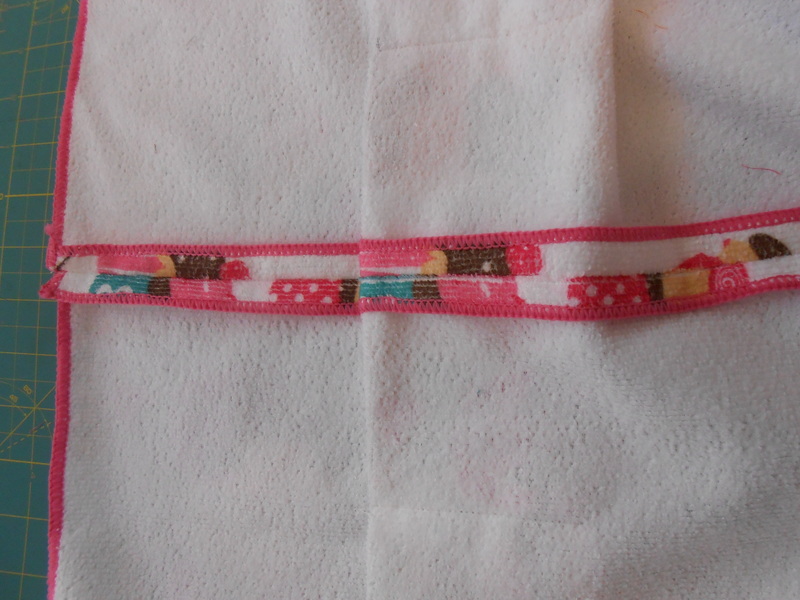 I’ve just finished a new apron using 2 dish towels again that I sewed together. 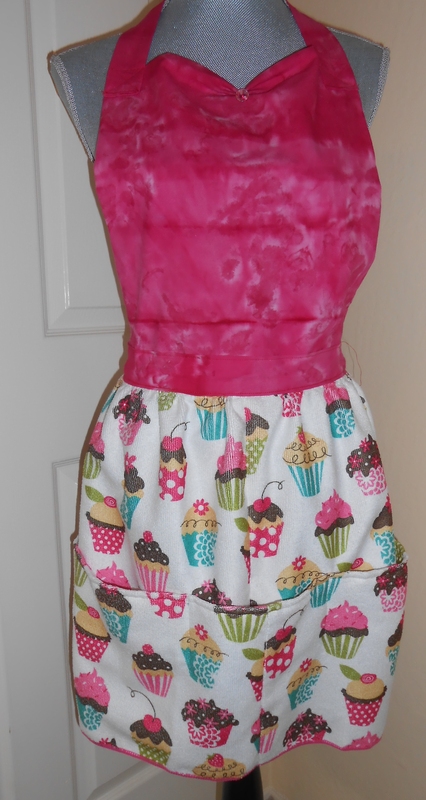 These aprons make so much sense to me because you don’t have to worry about wiping your hands on them. Now I feel like baking something. 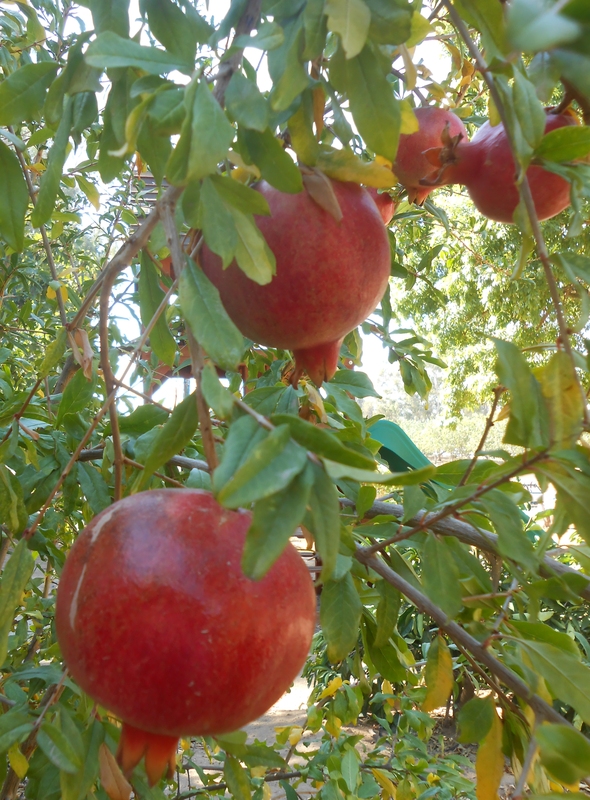 We have 2 small pomegranate trees and they’re ready for picking. Our oldest daughter will soon come and take some home. She loves the fruit and likes putting the arils in wine glasses when serving wine. I hunted for a recipe using the fruit and actually found one that was easy enough to do and was quite good. 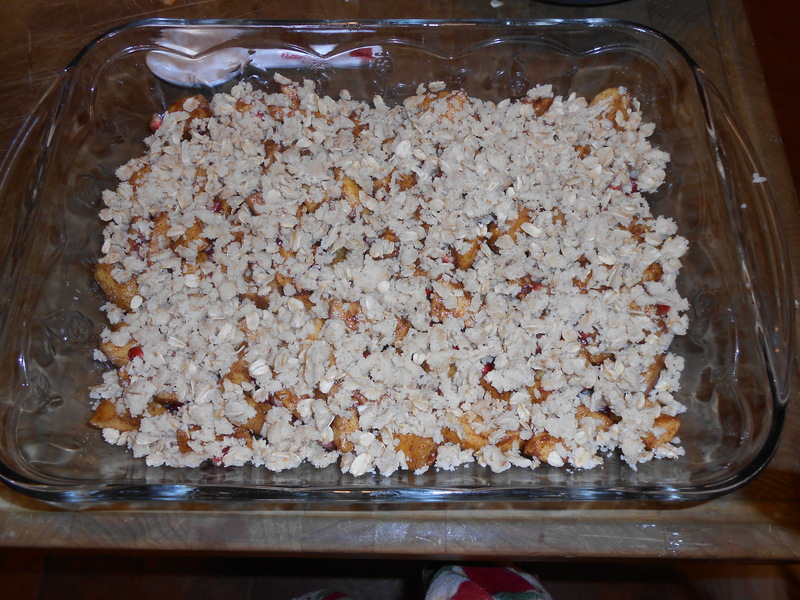 It’s called Brenda’s Apple and Pomegranate Crisp and was on the Allrecipes site. Preheat oven to 375 degrees and butter a 9 by 13 inch baking dish. 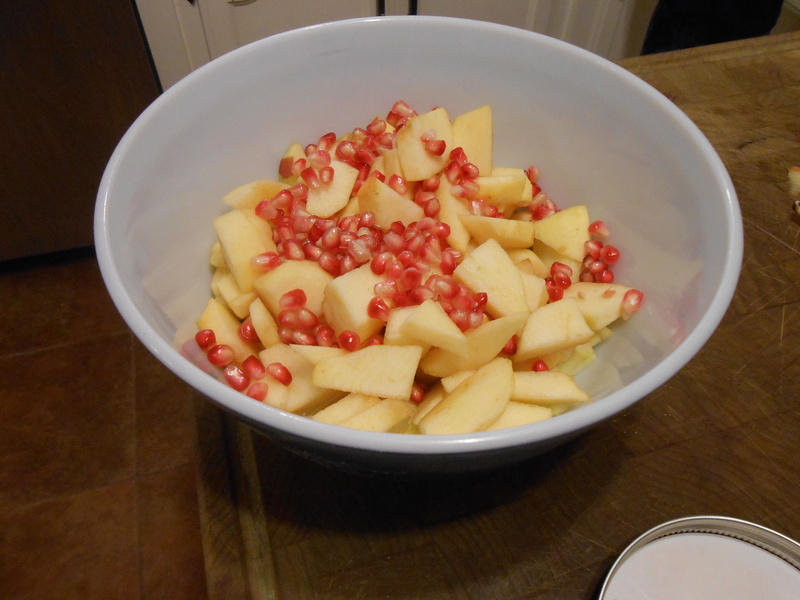 In a large bowl, toss together apples,pomagranate seeds, brown sugar, cinnamon and nutmeg. Spread evenly into prepared pan. In the same bowl, stir together the oats, flour, and sugar. Rub in the butter with fingers (I used a fork)’ until the mixture resembles coarse crumbs. Sprinkle on top of the fruit. 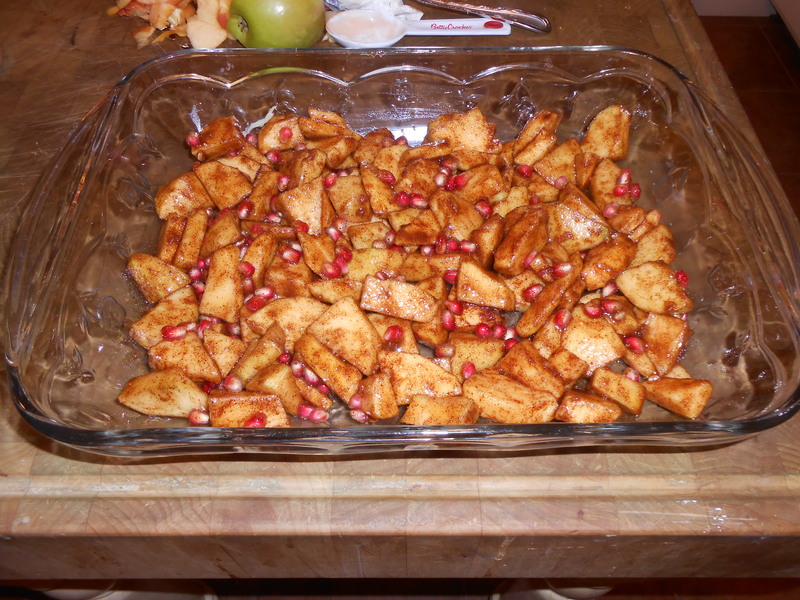 Bake 45 minutes in preheated oven or until apples are soft. Let stand 10 minutes before serving. This was very simple and easy recipe, except for peeling the apples. The pomegranate seeds do not add too much of a taste difference ( my opinion) except when you bite into a seed, but it was a tasty apple crisp. The last picture was taken before I baked it in the oven. Sorry to say I didn’t take a picture of the baked apple crisp, but it browned very nicely and then we ate it all up quite fast.